Properly measure all carb jets to be sure its within Rotax spec. High quality CNC'ed aluminum Dellorto jet block holds 21 main jets, 7 External Pilots and 7 Internal pilot jets (Jets not included). Conveniently mount the block to the toolbox with the magnet located on back of the block. 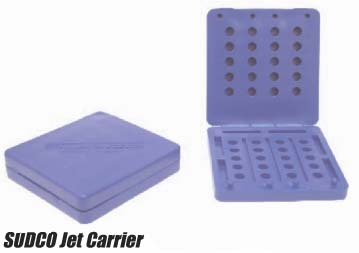 New improved Jet block has storage for 2 needles, 20 main jets, 5 pilot jets, 5 minor/idle jets, 3 emulsion tubes and 2 needles (not included). Also has built in bowl nut wrench. For Rotax/ICC/ROK. Jets and needles NOT INCLUDED. BRAND NEW ROTAX JET BLOCK (RTX-9). All new design with a compartment for needle/clip storage on one end and a wrench for easy carb bowl nut removal on the other. Jets and needles sold separately.